A New Brunswick couple is angry about a hair-raising incident that happened to them while driving a busy highway through Saint John. Blacks Harbour Fire Chief Dale Shaw experienced what he calls a ‘life-threatening incident’ while driving in his truck on Sunday afternoon. “Our lives were threatened, point blank. No matter if it was us or somebody else going down the highway,” says Shaw. Shaw and his wife were driving through west Saint John and approaching the overpass where they noticed three young people were walking. Someone threw a rock from the overpass -- an act that both they, and the police, describe as potentially life-threatening. “As we got closer, the fellow in the red hooded sweatshirt just nonchalantly threw a rock just like that into the traffic, and never even looked to see where it went. He just kept walking,” describes Sandy Shaw. After almost getting hit by the rock, the Shaws drove up to the overpass and saw three young men walking around the railway track. They called 911 but they were disappointed that the police were unable to respond in time to apprehend the suspects. Police say, at that time, all available officers were searching for a missing person in another part of the city. “We really would have wanted someone to come up and grab those young fellas that were throwing the rocks,” says Shaw. Police confirm there have been other serious incidents around the train bridge. “Obviously there’s an issue there, maybe the train trestle should have higher fencing put up on the sides,” adds Shaw. Shaw warns the next time it happens, may have a much worse outcome. With files from CTV Atlantic’s Mike Cameron. 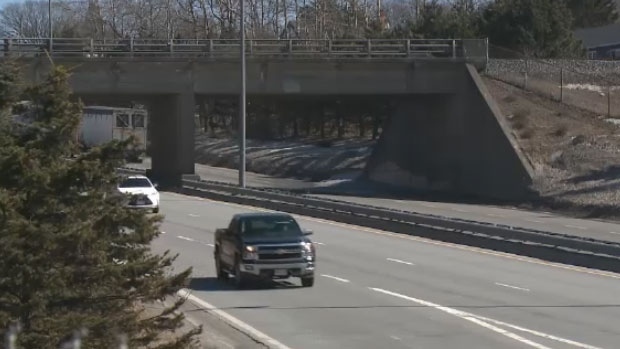 A New Brunswick couple says rocks were thrown at their truck from this Saint John overpass.